Before I give you a tour of the gear, lemme run you through a quick print I did. This screen didn’t turn out well, it was under-exposed for whatever reason, but since I knew this wasn’t really a ‘keeper’, I mostly did this to buck myself up by doing something productive, as well as to show my mother– who had come by –the process (Not that she didn’t know, both my parents had been making silkscreens long before they’d made me), and finally, to take photos for a montage to use as banners on the MAKE COOL SHIRTS YouTube channel and Twitter account. 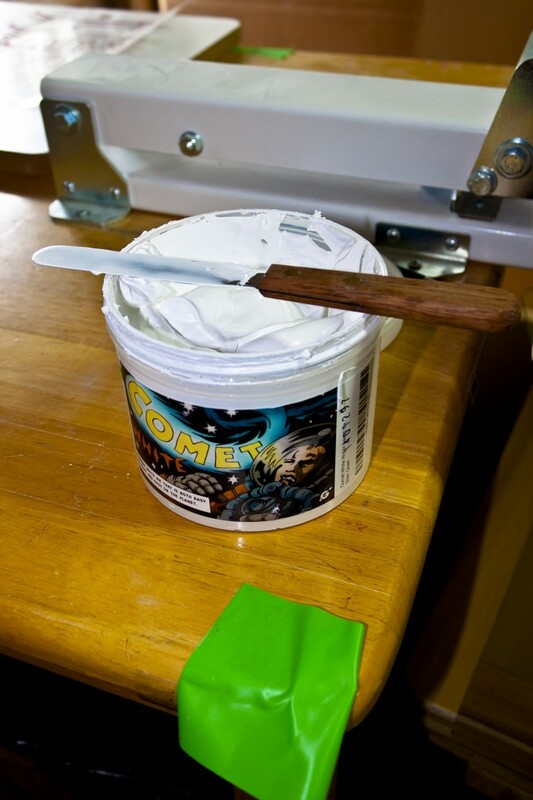 Green Galaxy ‘Comet White’, a water-based white ink that behaves and performs more like a plastisol. PVC-free, phthalate-free, water-based, and eco-friendly…and yet it lays down a perfect opaque white, even on black garments! w00t! It’s a really creamy ink, and it’s a wonder to work with… And even as thick as it is, it seems I need a higher mesh-count screen 305, perhaps? I shall have to ponder this, and other questions! 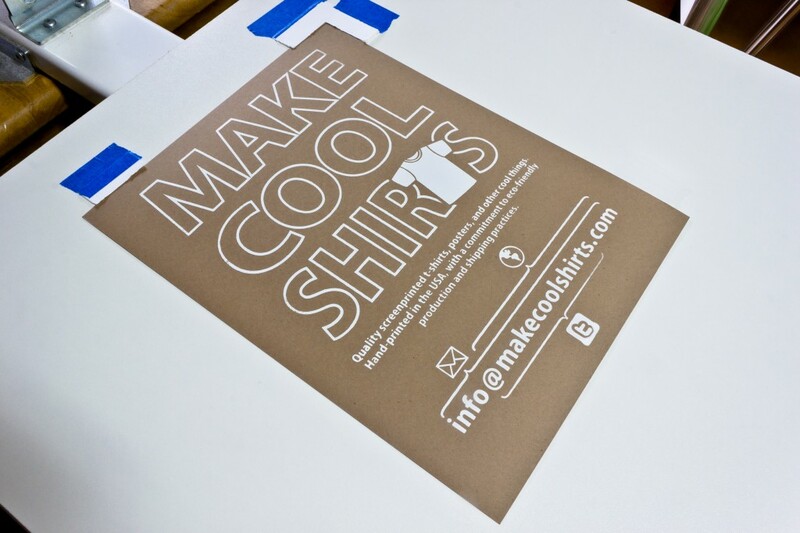 I’m printing these fliers on this nifty 80lb cover cardstock, in recycled Kraft. I have it in 8.5×11″ and 11×17″. I plan to use this stock for the hangtags for the shirts. It’s also available in 70 Text in those sizes, as well as in 46pt chipboard. 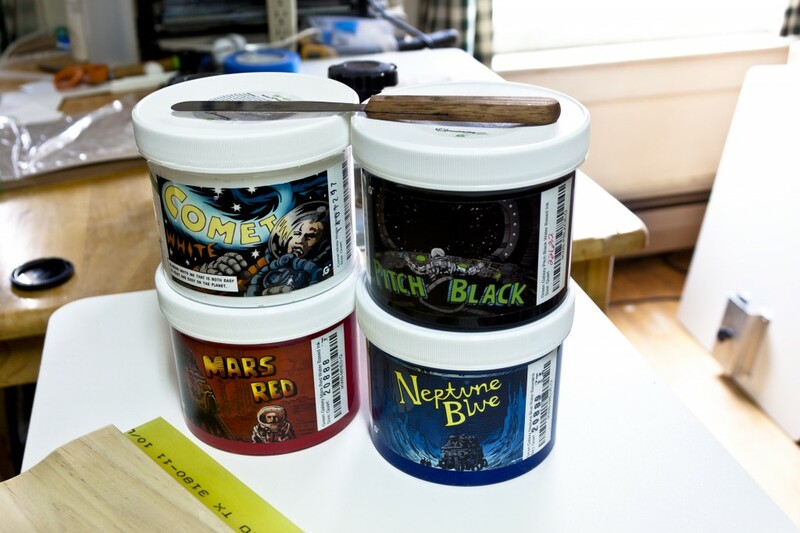 The first four Green Galaxy water-based screenprinting inks. As you can see, they’re very nice! Speaking of Ryonet, this is my ‘DIY Starter Press’ that I bought last December. 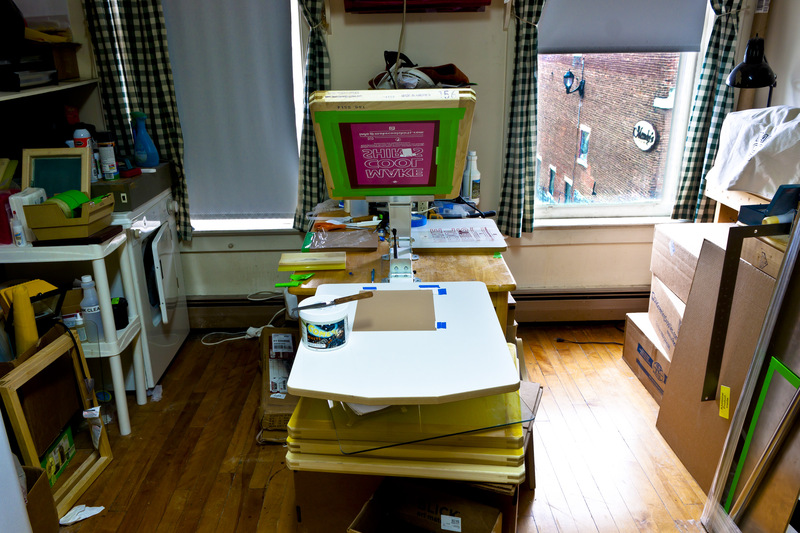 DIY Starter Press from Ryonet/SilkscreeningSupplies.com, with original platen removed. A couple weeks ago, I finally got some proper platens and I was able to remove the original 16×16 square platen. (Seen on the table behind it, I’m using it as a clean/bright surface for working with my film positives.) On the floor on the right, you can see the 20×26″ hybrid shirt/poster platen I bought, with bracket. 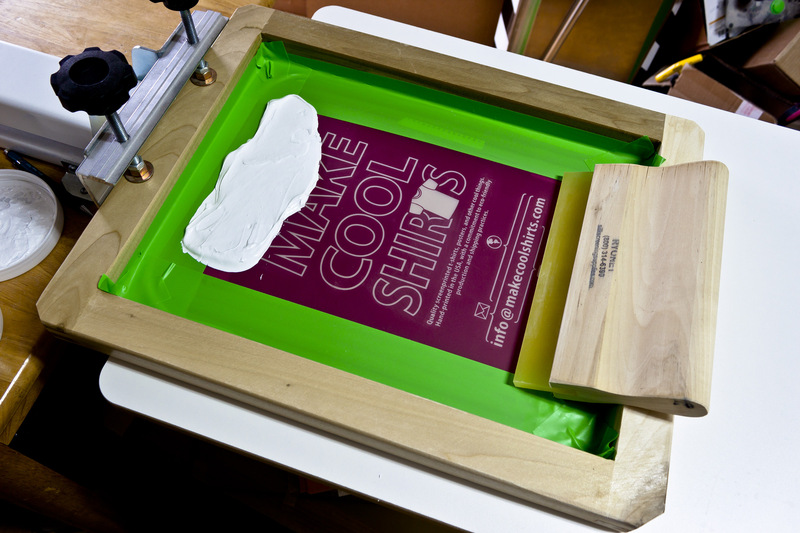 There’s also the 16×16″ shirt platen. 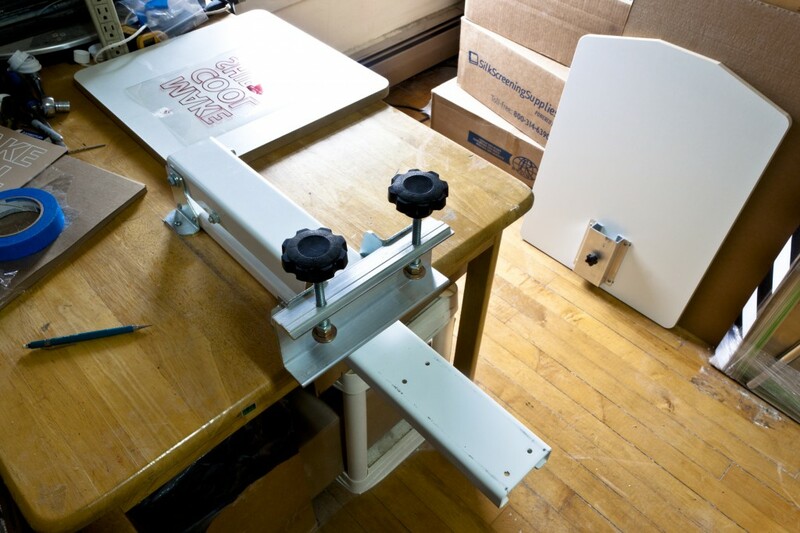 16×16″ shirt platen, installed on the DIY Starter Press, via bracket. The brackets are just so handy. With a turn of the knob, you can switch platens. 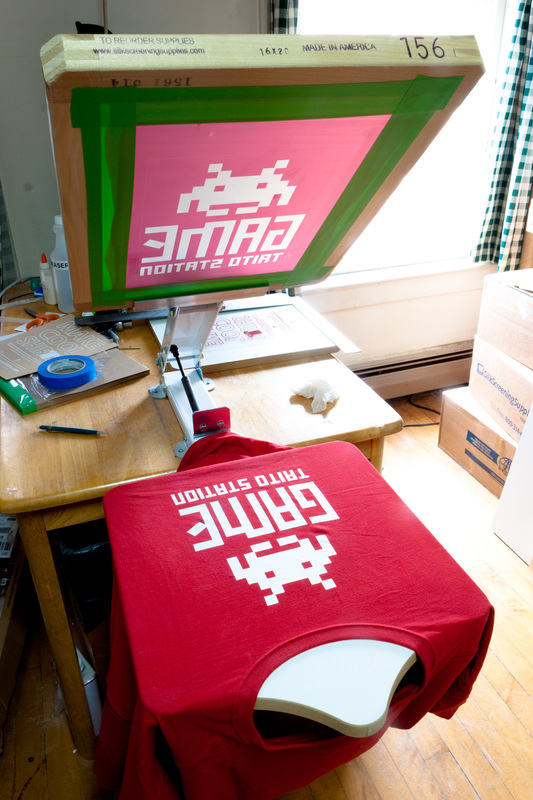 (Or adjust the position of a shirt platen.) I want to get an 18×18″ XL shirt platen, a sleeve/pant-leg platen, and a pocket platen… Then I should have all my bases covered… At least until I purchase my first multi-station press, and have to buy additional ones of everything. 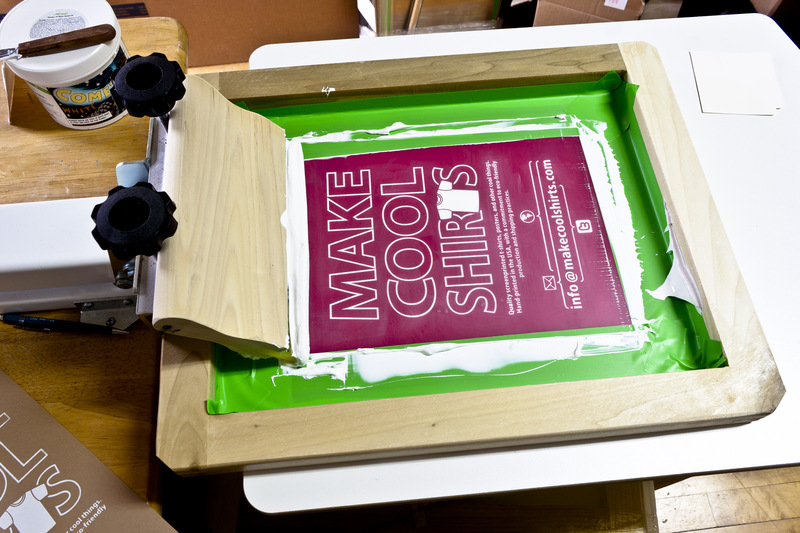 ;) The advantage of the 16×16 shirt platen over the regular 16×16″ platen is that the ‘neck’ centers the shirt. 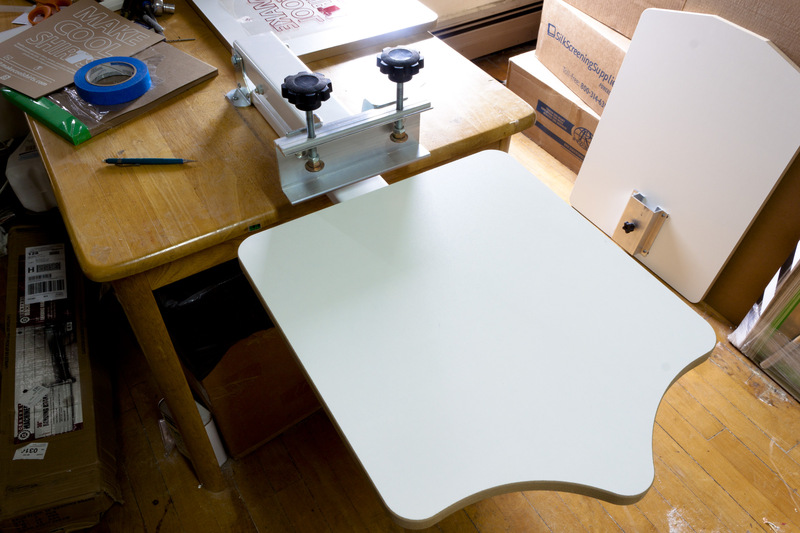 The 20×26″ platen is pretty cool, too. Besides being big enough to do quite a few different standard poster sizes, it really stretches shirts out flat. Perfect for doing ‘all-over’ printing. A photomerge I did of four shots of the little ‘supply’ area to the left of the table, situated around the laundry drier. 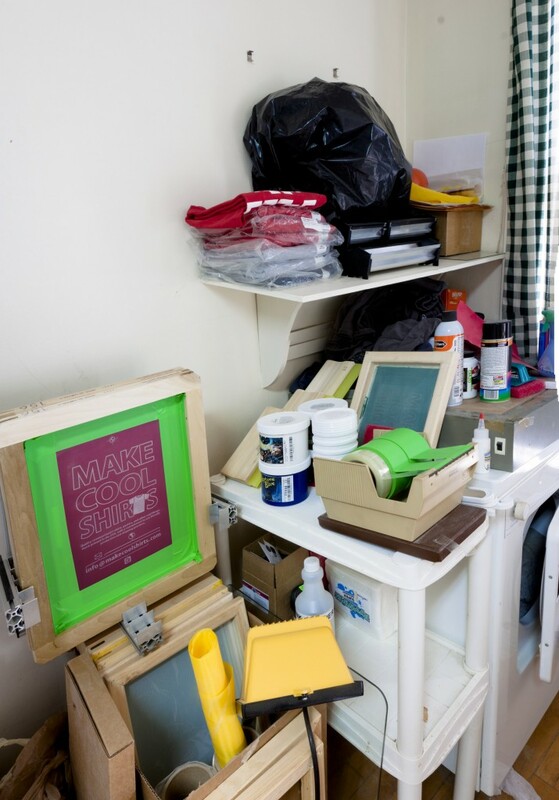 Ah yes, all my supplies… Tape, squeegees, frames, screens, screen mesh, inks, mixing containers, exposure lamp, etc. I have Speedball 10×14″ screens, Blick 10×14″ frames, Blick 12×18″ frames, in the rack there, are two burned 16×20″ frames from Ryonet. 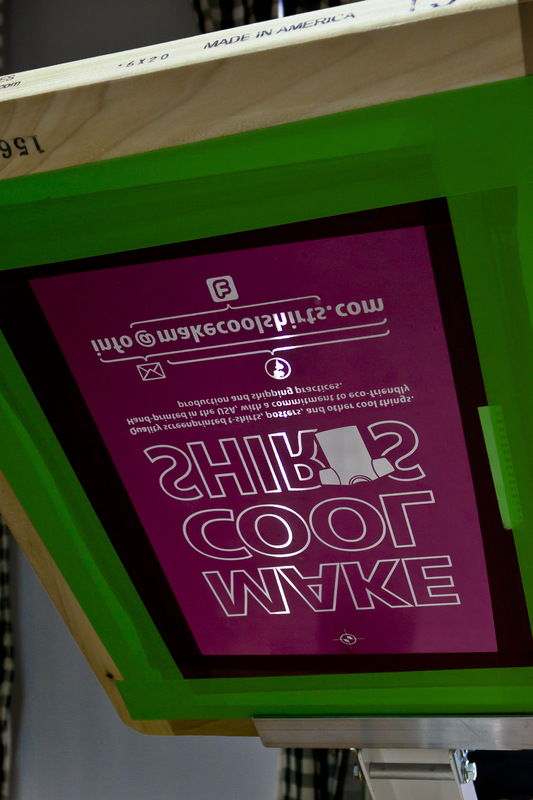 Up on the shelf, I have my scoop-coaters, 6, 9, 11, and 16 inches, a heavy-duty garbage bag (Double, actually) with the other two unexposed 16×20″ screens in it, and a small stack of shirts. Speaking of shirts– and those of you with sharp eyes may have noticed that one of them seems out of place… Well, that’s because it’s been printed already. A ‘Taito Station’ arcade shirt, for myself. I think that about does it for now, if I think of anything else, it’ll go in the next post! This post was awesome, i liked the process, i have the same press, the only thing i noticed where the screen is clamped, there is a pretty big gap underneath right where the platen starts(between the screen and platen) a lot of off contact then the gap gradually gets smaller as it goes down the platen. However, I’ve found that the easiest thing to do is loosen all the adjustments, and lay something the thickness of the desired off contact distance on the platen. (I use aluminium sheet, as I have plenty of that lying around.) Then it’s a simple matter to get the screen to lay flat on top of it, and then tighten all the adjustments back up. Haha good ol spam! And i actually ended up figuring it out! Not too long after riding on your post. I like green galaxy comet white, idk about green galaxy pitch black, i’m using 165 mesh screen and is eating ink like crazy. Have you printed a lot with it? I know that the GG black is very very thin compared to the white though, the other colors aren’t as thin, but white is definitely the thickest. A great run through of the package. Greatly appreciated and it gives me a little more confidence in my choice. Now I need to figure out how to follow you. Still active?